I recently attended the National Forum on Family Philanthropy in Washington, DC, where Harvard professor and best-selling social science author Robert D. Putnam delivered a riveting breakfast plenary presentation on the American dream. 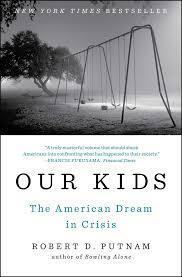 His most recent book – Our Kids: The American Dream in Crisis – paints a picture of how growing up rich or poor has changed in America over the last half a century, and why talent and hard work are no longer enough to level the playing field. Putnam opened his presentation by describing the phrase “our kids.” He said in his parent’s day, “our kids” referred to all the kids in their city or neighborhood. “We need to build our kids a swimming pool,” for example, meant that all the neighborhood children needed a place to swim in the hot months of summer. Fast forward to today, and the term “our kids” more often refers to one family’s kids, and only one family’s backyard swimming pool. This social isolation – highlighted by the change in meaning of “our kids” – is a fundamental feature of poor kids’ lives today. A look at some more granular data on children and families further shows indicators of this growing opportunity gap. “Parents provide their kids with two things: time and money,” Putnam contended while on stage. It turns out that time meeting children’s basic needs (“diaper time” as Putnam calls it) has remained relatively flat and the same across social classes, but developmental time (“Good Night Moon time” as Putnam coins it) as well as money spent on enrichment activities have widened dramatically between the rich and the poor over the last several decades. The observation about enrichment expenditures caught my attention. As a grantmaker, we have spent a good deal of time over the past couple years learning more about the out-of-school time sector, and specifically opportunities available for older youth in middle and high school. What Putnam described is what we found in our research: ever-widening gaps between youth participation in both school-based extracurriculars and enrichment expenditures by their parents, based on whether you’re rich or poor. Putnam pointed out that it costs $800/year, on national average, for a high school student to participate in one extracurricular activity like football or band. This “pay-to-play” approach came about in the 1980’s when school boards were under pressure to find new revenue sources. A consequence has been fewer poor kids participating in out-of-school time activities, and many schools in poorer neighborhoods cutting back on the activities they offer. Ironically, research shows that these are the very activities that foster soft skills – things like grit, teamwork and stick-to-it-iveness – that help kids succeed in work and life. In the end, Putnam’s presentation included just as many stories as statistical data, and his message came across as heartfelt: Most of us believe that everyone in America should have the chance to get ahead if they just work hard enough. But that belief is being shaken to its core as the numbers present a very different story, that money often matters more than ability, and that hard work isn’t always enough.